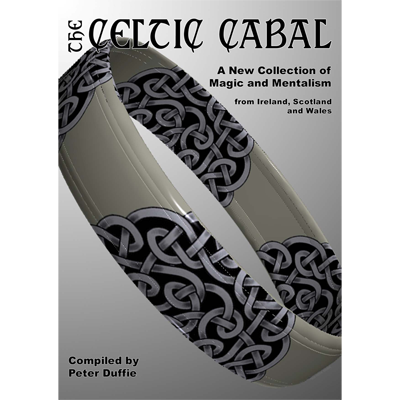 An Incredible Collection of Magic & Mentalism from Ireland, Scotland & Wales. 35 contributors - 45 routines, including two essays. Max Gordon: The Creative Side / The Last Straw. David Lees: Mentalism (essay) / Tarot Magick. Paul Lesso: The Jungle Book Test / Quadtratus Magic Square. Pete Lamont: Shape Up and Shape Down. Peter Duffie: Brainwoven / Triple Humdinger. Peter Arcane: The Birthday Book. Roy Walton: Magic Spell finds Great Hands. Dave Forrest: Press Gang / Christ Almighty! Eddie McColl: Bold Two Cards to Pocket Transpo. Euan Bingham: Less is More. Gary Middleton: Lying Leech / Mother's Pride. Scotty Johnston: Thanks to Braue. George McBride: Not for the Faint Hearted. Peter McLanachan: The Traveller Vanishes / Selected Vanish. Steve Thompson: It's Out of My Hands: Out of This World. Pat Fallon: Out of Sight Location. R. Paul Wilson: Royal Road Trip. Geraint Clarke: Creativity (essay) / Mis-Fortune. Trevor Lewis: Flight of Hand. Viv Davies: Tube Production / It Works for Me. BONUS: Tom Sellers Royal Flush Manuscript.